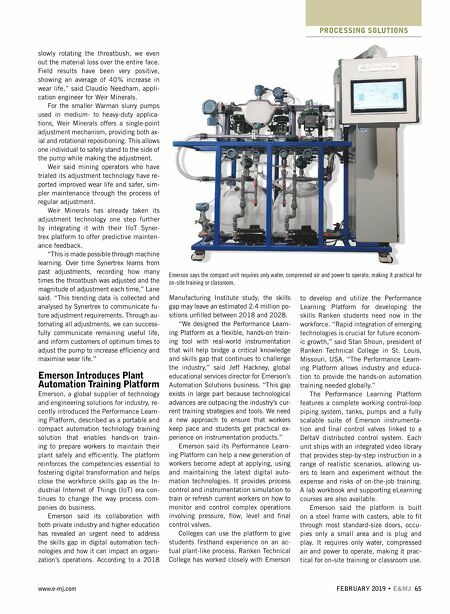 64 E&MJ • FEBRUARY 2019 www.e-mj.com PROCESSING SOLUTIONS According to the Fluid Sealing Associa- tion, the trade association representing vendors offering sealing products to pump users, almost all centrifugal and rotary pumps require a sealing system to pro- vide sealing integrity of the drive shafts carrying the impellers and protect against pumped fl uid leakage and the environ- ment outside of the wetted areas. These sealing systems range from traditional braided materials packed around the shaft to complex mechanical seal systems used in many modern pumps. In many applications, Weir Miner- als said in a recent bulletin, that the pump's throat bushing, or throatbush, is the component that has the shortest life compared to the impeller and liners with considerable variability. Adjusting the gap between the throatbush and the impeller front shroud reduces hydraulic recircu- lation in the pump. This prevents local- ized wear on the throatbush, improves hydraulic effi ciency and lowers the total ownership cost for the operator. To avoid impacting the plant's production, these adjustments are often performed while the pump is operating. However, this can have safety implications for individuals working at the front of the pump unit. "Manually adjusting an alloy throat- bush on a large pump requires several people and is labor intensive. It requires mechanical tools to adjust the four pusher bolts, one at a time, in order to reduce the gap between the throatbush and impeller. We wanted to fi nd a safer and quicker way to ex- tend the wear life of the pump with reg- ular adjustments, which led us to de- velopment of this technology," stated Marcus Lane, global product manager for centrifugal pumps for Weir Minerals. "Our automated throatbush adjustment solutions are available for pumps fi tted with either rubber or alloy throatbush- es on Warman slurry pumps used in the most arduous applications, and have been designed with our customers' safety and pump operation in mind," said Ron Bour- geois, director of slurry pumping technolo- gy group for Weir Minerals. "By mechaniz- ing the adjustment procedure, personnel are removed from the line of fi re, and the accuracy of axial movement is increased." Weir said its automated adjustment sys- tems speed up the process, allowing for more frequent adjustments with minimal effort. 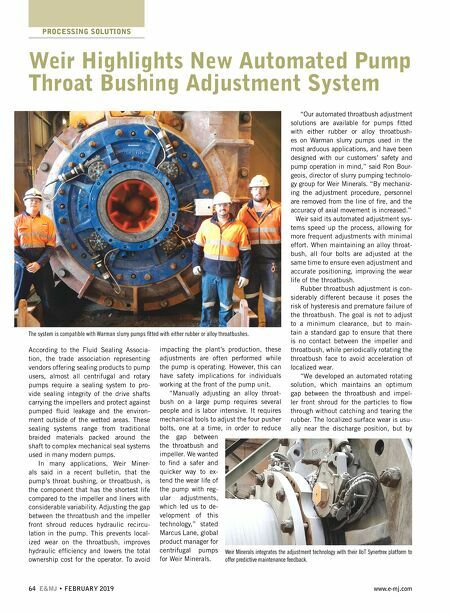 When maintaining an alloy throat- bush, all four bolts are adjusted at the same time to ensure even adjustment and accurate positioning, improving the wear life of the throatbush. Rubber throatbush adjustment is con- siderably different because it poses the risk of hysteresis and premature failure of the throatbush. The goal is not to adjust to a minimum clearance, but to main- tain a standard gap to ensure that there is no contact between the impeller and throatbush, while periodically rotating the throatbush face to avoid acceleration of localized wear. "We developed an automated rotating solution, which maintains an optimum gap between the throatbush and impel- ler front shroud for the particles to fl ow through without catching and tearing the rubber. The localized surface wear is usu- ally near the discharge position, but by Weir Highlights New Automated Pump Throat Bushing Adjustment System The system is compatible with Warman slurry pumps fi tted with either rubber or alloy throatbushes. Weir Minerals integrates the adjustment technology with their IIoT Synertrex platform to offer predictive maintenance feedback.